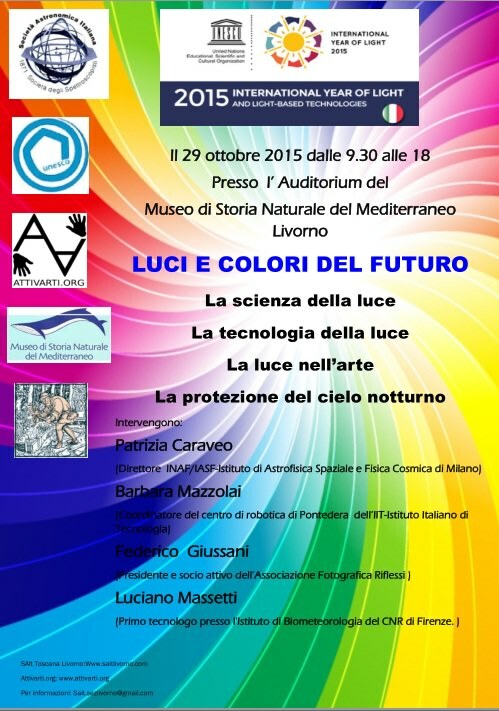 Thursday, October 29, 2015, starting at 9.30AM a symposium about “light and colours of the future” will be held in the auditorium of the Museum of Natural History of the Mediterranean in Leghorn, Italy (via Roma 234). The event is part of the International Year of Light Calendar, and will see the presence of experts dealing with light from various angles. Luciano Massetti, Senior Technologist at the Institute of Biometeorology of the National Research Council in Florence, active in a European research network on artificial light at night. The event is coordinated by SAIT, Leghorn chapter, and by the BuioMetria Partecipativa project (Attivarti.org association). The talks by the experts will be held in the morning. Should the participants be interested in additional information or interactions in relation to the topics presented in the talks, it will be possible to define the best way to proceed with this, either via additional meetings during the afternoon, at the Museum, or in other forms. To see how to reach the Museum, please check the dedicated page.